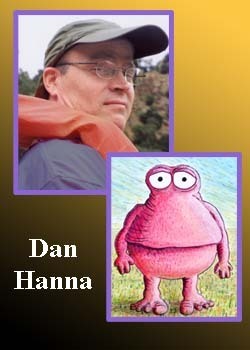 Dan Hanna has been a member of my local SCBWI for years. His first picture book, Pout-Pout Fish, written by Deborah Diesen, just came out. He also has four book trailers on Youtube, 1, 2, 3, 4, I am so pleased that Dan agreed to be interviewed. company I worked for capsized and sank into oblivion. I made a deal with myself to keep going as long as my savings held out. What is the most valuable advice you can give to a newly published writer? Become a celebrity. I can't emphasize this enough. I wish I'd thought of it when I was younger. What is one of your favorite children’s books that you'd like to recommend? I love anything by William Steig but "Amos and Boris" is my absolute favorite. Also, "The Man Who Walked Between the Towers" byMordicai Gerstein. It's beautifully illustrated and the fact that it's a true story illustrates something I heard long ago: "Be bold in life - and strange, unknown forces will come to assist you". Two more of my all time favorites are from my distant childhood. I highly recommend them but unfortunately I don't know who wrote or illustrated them. I must have read them when I was about 4 and they'vepercolated in my brain ever since. One was about a trip to the Moon and the other was about a migrating family of whales. called "Dummies for Dummies" (not really). book. Until then, I'll keep chipping away and hoping for some editorial fairy dust to land on one of them. hope to raise a large family of these chooks. Likeany good parent, I hope they grow up, achieve great success and then support me in my old age. The Sahara, because of its mysterious vastness, thegiant shifting sand dunes and the variety of exotic life clinging to the edge of existence beneath the harsh blazing sun. And also because a Root Beer Float tastes a lot better there. Dan Hanna has over 10 years of experience in the animation industry. His work has appeared on BBC America and The Cartoon Network. After many years as a writer/illustrator of extraordinarily unpublished picture book dummies he was finally chosen to illustrate The Pout-Pout Fish (which will be available starting on 3/18/08). This is his first book and he's very excited about it. modest bee-keeping operation from which he willproduce a thick and tasty Bavarian honey. It was amazing to see your work! I always knew you were so talented! Are you doing any presentation in LA me and sara love to be in one! Let's hear it for chooks! And sandy desserts -- er, deserts! And Dan Hanna! Dan, you funny guy you. Congrats on the book! See you at your launch (hopefully) at Adventures for Kids. I have to read this book as the "dessert" answer is one of the funniest things I have ever read! This reminds me that I owe Dan a latte. If I stay in hiding until Pout Pout is wildly successful, maybe he'll forget, too?